In the north east of Iran on the border with Azerbaijan is a mountainous province, called…. Azarbayjan. 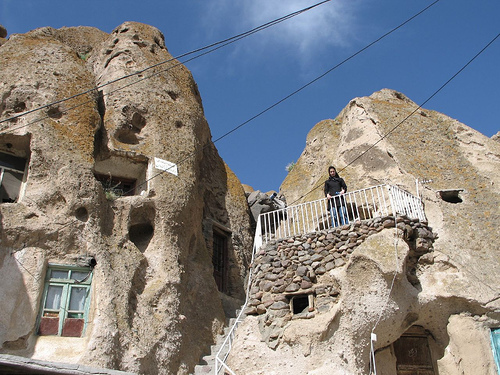 At the foot of Mount Sahand in Kandovan, the villagers live in cave homes carved out from the volcanic rock. The houses are of two to four storeys; the ground floor is used for animals, the first and maybe second floor as well, are used as living areas, whilst the top floor is used to store things. Most houses face south so residents enjoy sunlight during the day. The houses have windows with decorative glass. It is said that the houses have an “air circulation system that keeps the homes cool in summer and warm in winter”, but I suspect it is the great thermal capacity of the whole mountain rock that is doing the work. Nowadays the houses have electrical connection, water piped in and even waste plumbing. 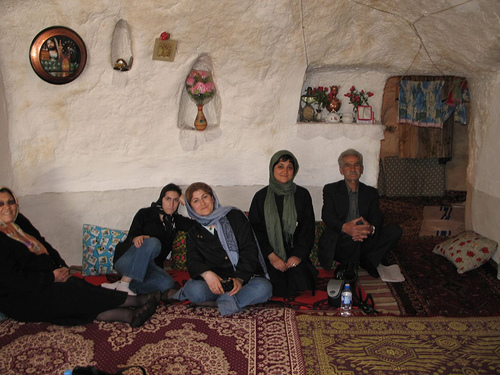 The Sahand is well known for its spring-water which is believed to be able to cure diseases. A river runs through the valley in the village, providing water for the agricultural terraces and animal husbandry. 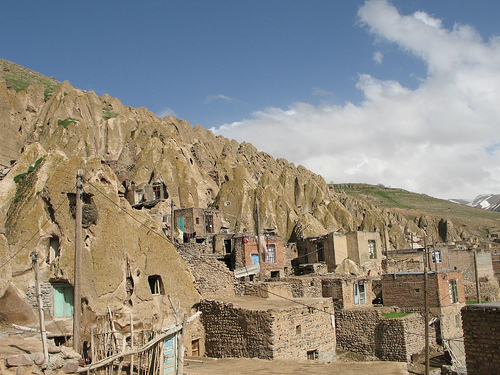 Back to the present era, People in Kandovan now “mostly live on their income from selling dairy products, meat, wool, honey, handcrafts and dried vegetables”. About 300,000 people visit the village each year. 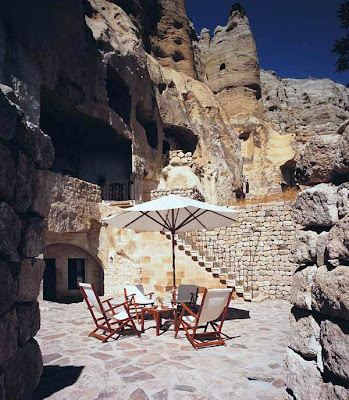 A relatively recent addition to the village is a 5-star Cliff Hotel dug out from the rock. 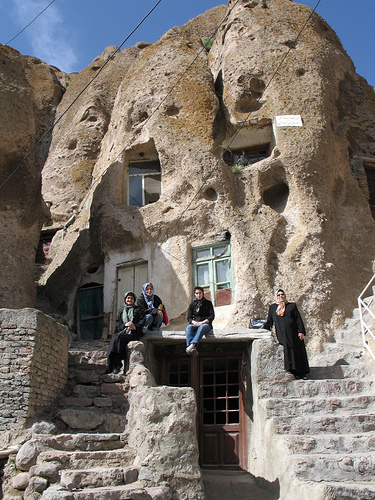 The name Kandovan comes from the old term "Kandou jan". "Kand" means village and "Jan" means existence. As in other places of outstanding beauty and unique features, the way os sustaining a “village existence” looks set to change. Thanks to Omid, blogging in Persian at www.youngengineer.blogfa.com for telling me about this wonderful village. Watch a slideshow of Eliza Tasbihi’s photos at Flikr. Highly Recommended!